The preparation of a meal can take hours even when you are a gourmet chef and you have created the same meal thousands of times over. Once the meal is complete, the preparation time is well worth it when you see the smiles on people's faces as they thoroughly enjoy their food. 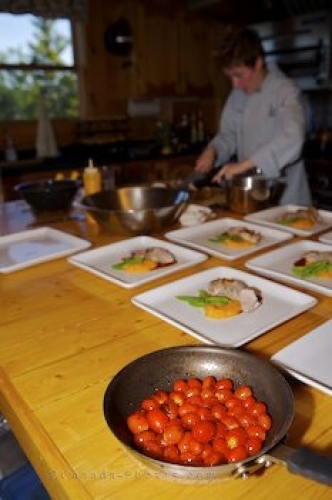 Picture of a gourmet chef in the midst of the meal preparation to be served to fishing lodge guests.